By default, Rar is not available in Fedora 10. If all you need to do is extract files from a Rar archive, unrar from RPM Fusion's YUM repositories will work. If you need to create Rar archives, then you will have to download and install the complete Rar package from DAG. The instructions below show you how. Only Need to Extract Files? su -c "rpm -Uvh http://download1.rpmfusion.org/free/fedora/rpmfusion-free-release-stable.noarch.rpm"
su -c "rpm -Uvh http://download1.rpmfusion.org/nonfree/fedora/rpmfusion-nonfree-release-stable.noarch.rpm"
Next, install the unrar packages from RPMFusion's nonfree repository. su -c "yum install unrar"
Need to Create Rar Archives? Now, install the source RPM. This will create a $HOME/rpmbuild tree. Please note that you do not need to be root. Next, build a binary package in $HOME/rpmbuild. Again, no need to be root. su -c "rpm -Uvh $HOME/rpmbuild/RPMS/$(arch)/rar-3.5.1-1.rf.x86_64.rpm"
FreeMind is a free mind mapping application written in Java which runs on Microsoft Windows, Mac OS and Linux operating systems. I successfully installed in my Fedora 12 desktop. The following is the detailed steps. FreeMind requires pure Sun's Java Runtime Environment. Please refer this link to install Sun's JRE. First become root, create a temporary directory and CD to it. Now download all the rpms you want for freemind and put them in your temporary root directory. There is no fedora support 10 and we are missing packages we need so.we will enable the generic repositories. 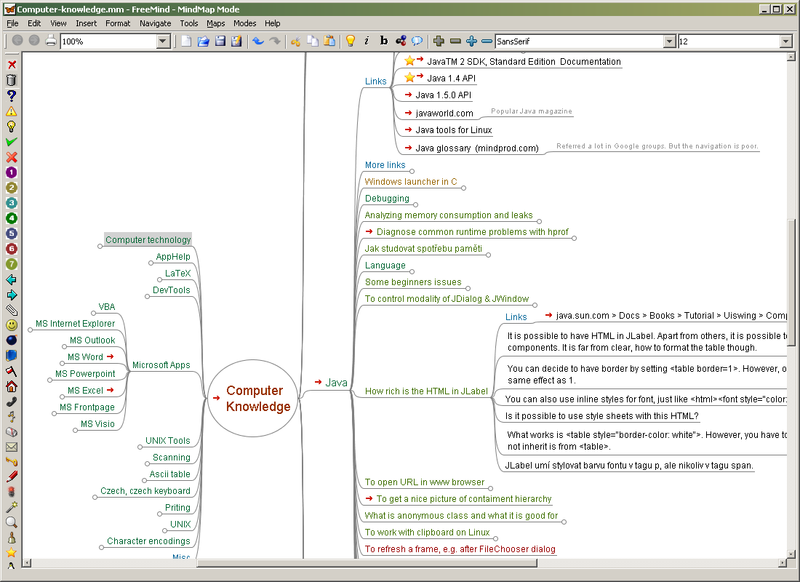 For more information about FreeMind and its installation, please visit: http://freemind.sourceforge.net/wiki/index.php/FreeMind_on_Linux. My Fedora 12 could not play any .wav and .wmv files and shown above error messages.